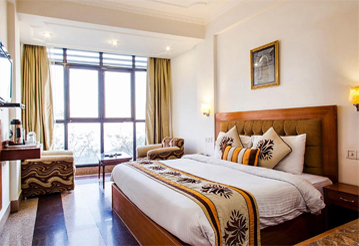 Hotel Green Castle is located adjacent to the historical monumnent Kashmere Gate,offers the most suitable and enjoyable staying service to the guests. The most preferred aspect of the hotel is in close proximity to airport, railway Station and bus stand. The famous tourists attraction are close to hotel like Chandani Chowk, Lal Mandir, Digamber Jain Temple, Red Fort, Jama Masjid, India Gate and Humayuns Tomb. Hotel offers basic facilities like power back-up, laundry service, room service, airport transfer, shuttle service, taxi services and travel desk.Guest can enjoy delicious famous street food from outside else room service is also available. Hotel Green Castle provides accommodation in well-appointed fitted with contemporary amenities like air-conditioning, cable television, sofa, intercom facilitymineral water, hot/cold water, shower area and attache bathroom with essential toiletries. The hotel offers a wide array of facilities and services along with warm hospitality to guests. © 2016 Tulip Inn. All Rights Reserved.